Our data shows that the average open rate for pharma emails overall including reminders/announcements was 9.61% with subject line length between 0-39. This is right in line with the rule of thumb of 45-50 characters or less for the simple reason that some email clients truncate subject lines beyond that range. Additionally, when it comes to mobile devices, shorter is always better because their smaller screens display fewer characters. However, subject line length is not the only factor that influences whether or not an email is opened. The message or offer greatly impacts the decision of recipients to open or not. Healthcare professionals are busy taking care of patients, so in the little time that they have to check their emails subject line length and content are both important. As they scroll through their inbox it makes it much easier for them to determine what is important or not if they can read an entire subject line versus one that is truncated. Also, it is of great value if subject lines are clear, concise, and provide key information about the email offer and call-to-action. To accomplish keeping the subject line short with solid content, place key words that are most relevant and will have the biggest impact within the first few words. 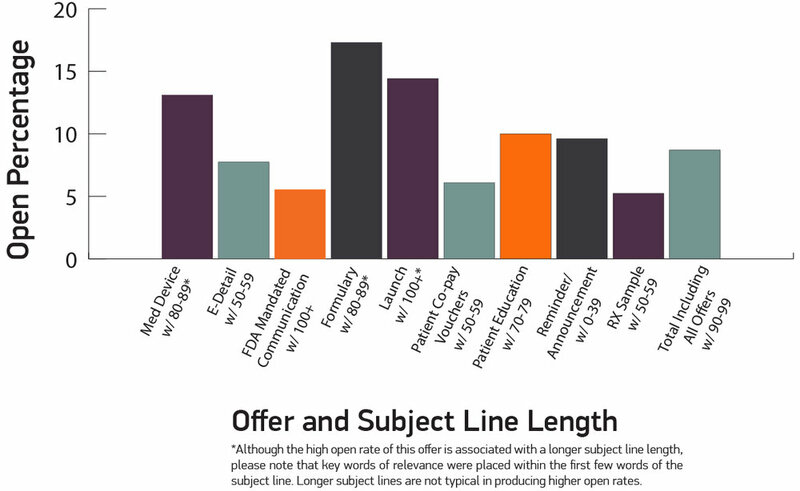 Other pharma offers including med device, E-detail, FDA mandated communication, formulary, launch, patient co-pay vouchers, patient education, and RX sample had high open rates, but with longer subject line character lengths showing that offer also impacts open rate. For more information about subject lines or digital healthcare marketing, contact me at 630-477-1548 or d-schultz@mmslists.com.